Unbelievably, it has more power than a Bugatti Veyron. There are plenty of renowned tuners such as Brabus and Wheelsandmore that will transform your stately Mercedes sedan into a tire-torturing beast capable of exceeding 200 mph. This latest monster comes courtesy of Posaidon, a German tuner that specializes in modifying Mercedes and Maybachs. Posaidon may not be as well-known as some of its competitors, but the tuner is about to make a name for itself with its new bonkers upgrade package for the Mercedes-AMG E63 S.
The sedan’s understated looks are deceiving, because the biturbo 5.5-liter V8 lurking under the hood now produces an astonishing 1,090-horsepower, making it more powerful than a Bugatti Veyron. And it’s somehow still road legal. It’s not as if the Mercedes-AMG E63 S isn’t already a potent machine, either, since it packs 585-hp, so Posaidon is offering a substantial performance upgrade that rivals the likes of Ferrari and Lamborghini. To achieve this supercar-rivalling power output, Posaidon has made some extensive hardware modifications. The V8 engine’s displacement has been bumped up from 5.5 liters to 6.5-liters, while the two turbochargers have been upgraded with a higher-capacity intercooler. The luxury sedan has also been fitted with a stainless steel sports exhaust and received a comprehensive ECU remap. With these modifications, the modified E63 S now produces 996 lb-ft of torque, which meant the seven-speed automatic gearbox had to be mechanically upgraded to handle the increased load. Elsewhere, lower uprated coil-over suspension has been fitted to the front front, while the factory rear air suspension has been lowered to enable the chassis to handle the brutal power. Large original AMG wheels have also been installed to maximize the mechanical grip, and the speedometer now goes up to 380 kph reflect the car’s improved performance. Posaidon hasn’t provided any performance figures, but it’s safe to assume it’s significantly faster and more powerful than the standard E63 S, which takes 3.6 seconds to sprint from 0-62 mph before reaching a top speed of 186 mph. 850-hp and 920-hp upgrade packages are also available. It is basically a smaller variant of the S-Class. 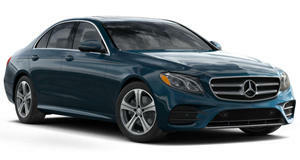 The Mercedes-Benz E-Class remains a top-tier executive sedan – though those looking for fun behind the wheel may want to look elsewhere.